Manitoba Museum is setting sail with the return of one of its most popular exhibits. A replica of the 17th-century British ship that led to the creation of the Hudson's Bay Company and the opening of Western Canada to commerce is boarding passengers again after several months of renewal. The Nonsuch gallery reopened Friday morning at a media event. "Manitoba has some iconic attractions, we know that, but this is absolutely one of them," Premier Brian Pallister told reporters. The original ship sailed across the Atlantic Ocean in 1668-69 to help establish a fur trading route via Hudson Bay. The replica was built in 1968 in England to celebrate the tricentennial of the Hudson's Bay Company. It sailed 14,000 kilometres through salt and fresh water before arriving at its home in Winnipeg. Three of the replica ship's original crew members were on hand Friday for the reopening. Millions of visitors have seen the ship since the gallery opened in 1974. Two of them — pop stars Justin Bieber and Selena Gomez — dined aboard the ship during a 2011 visit to Winnipeg. The renewal of the gallery saw only minimal impacts on the ship, with the exception of new rigging. Its place in the historical timeline, however, has changed. Before renewal, the Nonsuch Gallery replicated Deptford, England, in 1668 as the ship prepared for its voyage. The narrative has been altered so the Nonsuch is back in England, loaded with furs and goods traded with the Cree from its Hudson Bay travels. "For our visitors, it was hard to understand why all of a sudden you left the other Manitoba galleries and here you are in England," said Amelia Fay, curator of the museum's Hudson's Bay Company collection. "We've been able to better connect it to the rest of the museum." Renovations to the gallery, including new lighting and auditory effects, were done for immersive purposes. At the tavern, visitors can overhear Captain Gillam and his crew regale patrons with tales from their voyage overseas. A new pier allows visitors to appreciate the ship's new rigging and unfurled sails, while new audio and lighting effects simulate the passage of day and night and changes in the weather. "You'll hear people talking, you'll hear music, dogs barking, a rooster crowing, it's kind of fun," Fay said. Elsewhere, the Boreal Corridor leading to the gallery now has 700 insect specimens to examined. New stories are explored, such as the first encounter between the Cree of James Bay and European explorers, and the journey of the replica ship to its Winnipeg home. Finally, a new gallery space was built, offering a view overlooking the ship, a model ship display and highlights of the Hudson's Bay Company's history on the water. 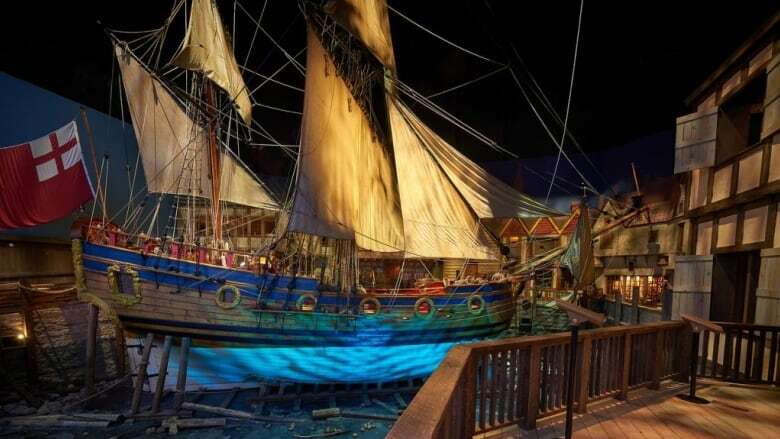 "I invite all Manitobans back to the Manitoba Museum to rediscover their ship, the Nonsuch. Whether it's the first time or your 10th time, I guarantee you will learn something new when you visit the renewed Nonsuch Gallery," Claudette Leclerc, executive director and CEO of the Manitoba Museum, said in a media release. The opening marks the completion of the first of four galleries — Nonsuch, Grasslands, Orientation and Urban — to be renewed as part of the $17.5 million capital campaign, including the creation of a new Winnipeg Gallery. The Progressive Conservative government pledged $5 million for the campaign in a combination of a $1.4-million grant and $3.6 million to match funds from private donors. That number is half of what the previous NDP government offered. The Asper family and foundation donated $500,000.